ISO 9001:2015 or any other ISO standard implementation and certification may not always be at the top of a startup company’s wish list, given the financial and operational pressures many new businesses find themselves under in the early stages of development. With decisions to be made in terms of what the system implementation and certification might cost and what benefits they yield, is ISO 9001:2015 or for that matter any ISO standard a reasonable investment for a startup? But, implementing all elements of the standard can actually help a startup company. Whether only implementing an ISO standard, or pursuing certification along with it, there are many advantages for the startup. Certification to the standard, however, can bring market reputational benefits and ensure entry to tenders and levels of business that can propel a startup business into relationships rapports and contracts. Before certification takes place – normally 1 month to 3 months down the line – there are still many benefits to be had. Evaluating competencies and learning to evaluate performance against objectives is an excellent habit encouraged by the standard that will provide huge benefits to a startup. 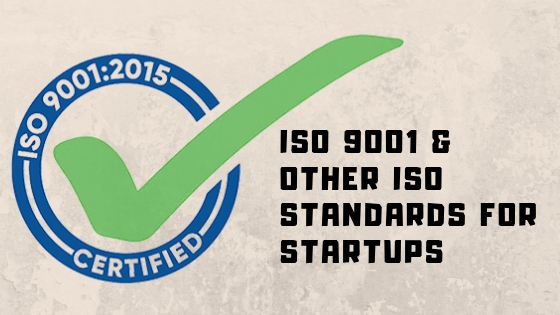 With ISO standards rapidly becoming an entry level certification for many private companies, and local government contracts, the ISO standards certified startup has access to markets that other organizations do not. Implementation and certification costs money, but it is also often the case that there are streams available for startup companies, so this may be the most sensible period to implement ISO standard for such a young business. With the benefits clear to see, definitely the startups afford to do? The process approach: Establishing standard processes in the early days of a business can yield actual benefits as thebusiness grows. Forming uniform / streamlined processes in the early days not only can help the organization provide consistent products and services, but also provides a sound foundation for future expansion and growth. The organization actually breakdowns the entire system into levels of processes and sub-processes and their varied interactions and Introducing new employees to processes that are established and well documented can help save on time, cost, and accuracy of delivery. Developing a risk and opportunity based thinking approach: While risks and opportunities are some of the most critical and essential elements of the ISO 9001:2015 or any standard which is following Annex SL (HLS- High Level Structure) after 2015 standards, they have always been at the center of successful businesses. Building a culture where startup employees have a keen eye for issues (external & internal) driven risk and opportunity will serve a business well, and allow profits to be maximized while risks are identified early and can be mitigated. Risks based thinking is now an integral part of any ISO standard implementation. Setting goals and objectives: Goals and objectives, targets are key elements of the ISO 9001:2015 or any ISO standard, and the most essential elements for any new business. Establishing the practice of developing a plan / program, setting, reviewing, setting responsibilities & resources and taking action against objectives and the subsequent results is a vital part of driving growth and improvement early in a new business’s life. The Plan, Do, Check, Act technique: This is a fundamental techniquefor the ISO 9001 or any other ISO standard, and learning to use this effectively and efficiently can benefit any startup business. At a time when speed of action seems very important to a young business, it may well pay to build a culture amongst the processes and staff where careful planning, monitoring, and adjustment of actions taken helps to provide excellent and consistent results for the startup. This also is implemented as a model for continual improvement. Understanding the requirements of Interested Parties: The startup can initially identify all its interested parties, and understand their needs and expectations, and what actions can be taken to fulfill those needs & expectations. Change management: When changes happen throughout any of the early stages of a startup. Inability to handle change and develop accordingly is one reason that many startup organizations do not survive through the initial phase of business. ISO 9001 and other ISO standards can surely help the organization control and manage changes (people/process) with the correct mix of planning, action, and review. Planning and Acting on changes is one of the most sensible things an aspirational startup can do, and recently has become a fashionable topic for investors to ask startup businesses about before making a financial commitment. After all, if a startup is not equipped for change, then growth cannot happen. Drive your sales up using ISO 9001;Implementing ISO 9001 or any ISO standard can definitely grow sales for the business. Understanding enquiries, orders and reviews, taking customer feedback, acting on customer complaints, learning how to monitor and review, conducting root cause analysis and developing an effective corrective action process, and building a culture of continual improvement can all help to drive sales. Establishing these good habits in the early days of a startup can help to establish the good practice that helps your startup grow. As an ISO certified business, the organization is supposed to be following the internationally recognized standards, which adds to your credibility and image. Promoting an ISO certified organization/startupwill be easier, as it shall attract more users than anyone who is without ISO certificate. This is because, the ISO certification answers too many queries at once without explaining anything. If your startup is competing for tenders or getting projects from enterprises, the ISO standard certification increases the chances of success by making your business prominent, quality assured and authentic. Management principles are the foundation requirements for ISO standards, and following these principles ensures customer satisfaction which results as customer assurance and retention. A Startup can always look forward to smooth sales and marketing processes in action, the company can increase revenue and market share through flexible and fast responses to the new market opportunities. With ISO compliance streamlining of internal processes, company makes sure that the errors are not repeated which ultimately leads to increased productivity. Documented and established procedures are also easier for staff and processes to follow. With ISO certification, the interested parties have confidence in the company in terms of consistency, effectiveness and efficiency of the organization, and that their needs and expectations will be understood and acted. 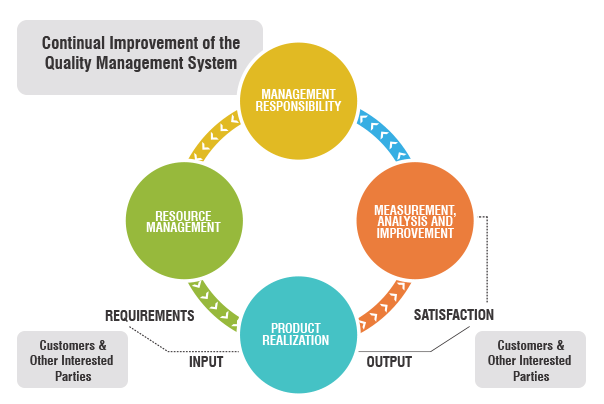 With ISO compliant processes the organization achieves efficiency in the delivery of product or service. With improved procedures, planning and administration within and across departments, the overall procedures are optimized. The documented and established procedures reduce costs as well as shorten the cycle times through effective use of resources. Well defined and documented and established procedures do not just improve the consistency of output, but also make sure that this quality output is constantly measured. Optimized procedures do not just identifies a defect earlier but also ensure that a corrective action is taken to prevent the same defects from recurring; or reaching the customer, from where a complaint might arise. This is how the defect rate decreases and the defects are corrected at a lower cost and many a time eliminated as well. With proper processes in action, you have the option for evidence-based communication and decision making, which is faster yet efficient. With constant focus on improving processes and organizational output, you will find attain efficiency and cost savings. Keeping the pace, improving year after year, and growth is the ultimate destination! ISO certifications do not just help in assuring to customers that you are a well-run business and follow international standards, but also improve the overall business environment, thus bringing the business on a fast track growth cycle!